Is there a bat trapped in your apartment that only John Malkovich knows how to handle, but you’re too busy dealing with loose bats to find the relevant Ask Me Anything thread archived on Reddit? Do you want to know what Bill Murray thinks about peanut butter and pickle sandwiches, but you don’t want to dig through a million posts asking him about movies and comedy? 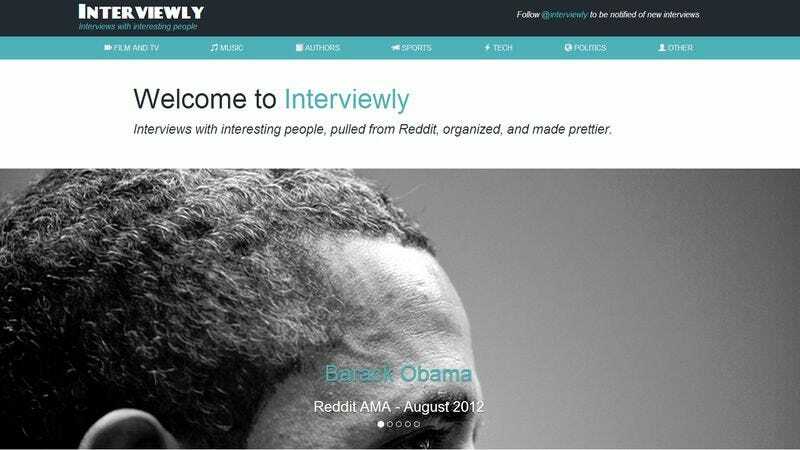 Your suffering is over: Interviewly is now here to help. (Also to the bat guy: Maybe re-evaluate your life decisions?). The new website, which it’s hard to believe no one thought of before, pulls all of the interview wheat from the Reddit AMA chaff and posts it in a tidy standard Q&A format. As you might imagine, the “interviews” appear with a slight delay, as Interviewly can’t keep up with every AMA posted to Reddit. Still, there’s a large back catalog to explore, and new AMAs are interview-ified every day.